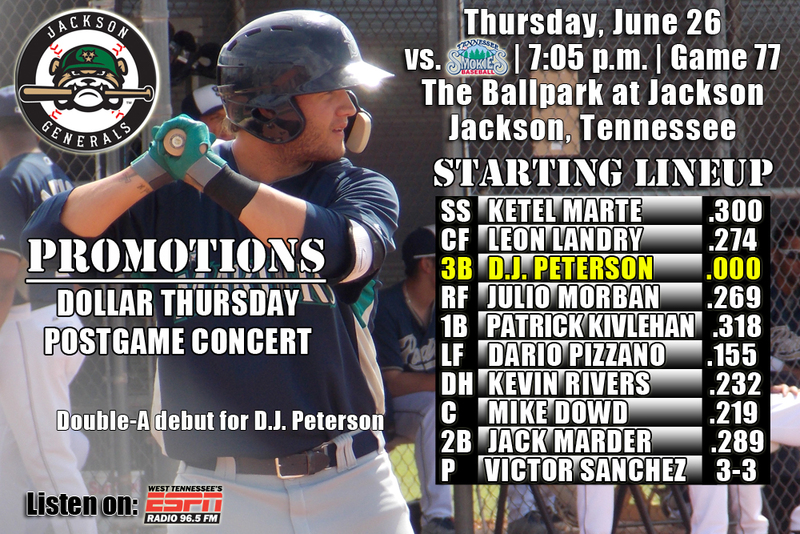 • Tonight the Generals return continue a 10-game homestand vs. Tennessee and Mobile. This is game three of a five-game series against the Tennessee (0-2). The Generals are 4-7 against the Smokies this season including 1-5 at The Ballpark at Jackson…were 2-3 on recent road trip to Mississippi. • 3B Patrick Kivlehan recorded 3 hits and DH Dario Pizzano hit his 5th home run of the season, but it wasn’t enough as Jackson fell to Tennessee 4-2 on Wednesday afternoon. • Kivlehan (3×4) and RF Julio Morban (2×4, R, 2B) combined to record 5 of the team’s 7 hits. Pizzano (1×3, R, HR, 2 RBI) drove in both the Generals runs with a 2-run home run in the 5th inning. • Starter Stephen Landazuri (5.0,4,0,0,2,1) allowed 4 hits in 5.0 innings, but did not factor into the decision. LH Cam Hobson (3.0,4,3,3,0,3) recorded his 6th loss of the season, allowing 3 runs in the 6th inning, while RH Stephen Shackleford (1.0,1,1,1,0,1,HR) allowed a solo home run in the top of the 9th. • D.J. Peterson, the No. 2 prospect for the Mariners, according to Baseball America and was Seattle’s 12th overall selection in the 2013 draft out of New Mexico bats 3rd playing third base tonight for Jackson. • Peterson In 65 games with the Mavericks hit .326 (89×273) with 51 runs scrored, 23 doubles, 1 triple, 18 home runs, 73 RBI, 23 walks and 6 stolen bases. At the time of his promotion, he ranked among the California League leaders in nearly every offensive category, including slugging percentage (1st/.615), total bases (1st/168), RBI (1st/71), extra-base hits (T1st/42), home runs (2nd/18), doubles (3rd/23), hits (T5th/89) and average (6th/.326). • Since May 8, Peterson leads all minor league players with 57 RBI, while ranking 2nd with 16 home runs. Peterson hit 16 of his 18 home runs with High Desert over 37 games (5/11-6/23). He hit safely in each of his final 10 games with 8 mutli-hit efforts, batting .442 (19×43) with 11 runs scored, 7 doubles, 6 home runs, 22 RBI, 5 walks and 1 stolen base (6/9-23). • On Top of the League in June – The Generals are T-2nd in the league with an 11-8 in June. The .298 batting average is 2nd in the league this month. This is after posting the first 20-loss month since June, 2007 by going 9-20 during the month of May. • 3B Patrick Kivlehan has hit safely in 18 of his last 19 games, batting .431 (31×72) with 13 runs scored, 9 doubles, 1 triple, 2 home run, 20 RBI, 7 walks and 1 stolen base. After going just 4-for-35 in his first 10 Jackson games from May 10-21, Kivlehan has reached base safely in 29 straight games since May 22-June 23, batting .381 (40×105) with 18 runs scored, 10 doubles, 2 triples, 4 home runs, 28 RBI, 14 walks, 3 stolen bases and a .446 OBP. He has raised his season average from .114 to .314. Kivlehan’s 29 consecutive on-base streak is the longest on the team and trails only John Andreoli-TNS (30, 4/6-5/11/14) for the Southern League lead. • SS Ketel Marte went 0-for-4 yesterday, snapping his hitting streak at 11 games. During the streak he hit .341 (14×41) with 7 runs scored, 8 RBI, 1 walk and 2 stolen bases. It was his 5th hitting streak this season of at least 7 games (last: 13 G, 5/25-6/7). He has also hit safely in 24 of his last 26 games, batting .311 (33×106) with 16 runs scored, 5 doubles, 1 triple, 18 RBI, 2 walks and 4 stolen base. • INF Jack Marder has reached base safely in his last 8 games, batting .429 (12×28) with 4 runs scored, 2 doubles, 1 home run and 3 RBI. Since May 24, Marder has hit safely in 20 of 23 games with 10 multi-hit efforts, batting .381 (32×84) with 16 runs scored, 5 doubles, 2 triples, 3 home runs, 12 RBI and 5 walks. • C John Hicks is batting .337 (31×92) with 16 runs scored, 7 doubles, 1 triple, 2 home runs, 12 RBI, 8 walks and 4 stolen bases in 23 games. During this stretch, since May 11, he has raised his season average from .224 to .298.